Seating Dynamics has Single Axis and Multi Axis Dynamic Head Support Hardware. 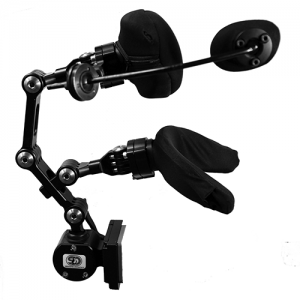 The Dynamic Head Support Hardware allows neck extension, diffusing and absorbing force to protect the client, protect the hardware, and reduce overall extensor tone. The Dynamic Head Support can be used on its own or in combination with the Dynamic Rocker Back and Dynamic Footrests. “The use of a dynamic headrest on this kind of patient should be the standard, not just to protect the equipment, but the patient.” Referring to clients who repeatedly contact their head support with significant force. The Single Axis Dynamic Head Support Hardware moves up to 9 degrees posteriorly in midline (the amount of travel will vary with the combination and orientation of the links). The range that the pad travels is 1” to 2” depending on the combination and position of links). If force is exerted against the side of the head pad, the hardware will still respond with posterior movement, accommodating some rotation. The hardware includes a mounting plate, three links to obtain the height and specific position required, and one interface adapter for common head support pads (pads not included). The elastomers can be switched to change the level of resistance. The hardware comes standard with Blue (medium) elastomers to provide movement and to return the client to a starting position. If more resistance is needed, Green (firm) elastomers are provided with the unit. The mounting uses the standard 2” square or 2” X 1” bolt pattern for M6 or ¼” screws. The mount is compatible with our quick release mounting for quick removal of the head support assembly without the use of tools. The links are available in three sizes: 2”, 4”, and 6”. Each Single Axis Dynamic Head Support Hardware kit includes one of each of these link sizes. Extra link lengths are available. The various length links may be combined in any order to achieve the desired position and either 2 or 3 links can be combined. 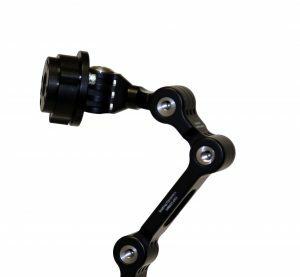 The Multi-Axis Dynamic Head Support Hardware is capable of movement up to 10 degrees in any direction up to 360 degrees. The range that the pad travels is 1” to 2” depending on the combination and position of links. This movement will capture posterior, as well as lateral / angular movement. The hardware includes a mounting plate, three links to obtain the height and specific position required, and one interface adapter for common head support pads (pads not included). The elastomers can be switched to change the level of resistance. 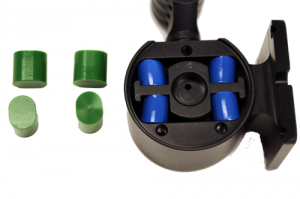 The hardware comes standard with Blue (medium) elastomers to provide movement and return the client to a starting position. If increased resistance is needed, two Green (firm) elastomers are supplied to be used in the anterior / posterior axis. The mounting plate is a standard 2” square plate with a 2” X 1” 4 bolt pattern for M6 or ¼” screws. The links are available in three sizes: 2”, 4”, and 6”. Each Multi-Axis Dynamic Head Support hardware kit includes one of each of these link sizes. Extra link lengths are available. The various length links may be combined in any order to achieve the desired position and either 2 or 3 links can be combined. Many clients require some type of lateral support to limit neck rotation or lateral flexion. Lateral supports are sometimes used to mount switches for access to assistive technology devices. 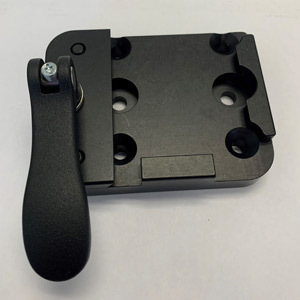 Seating Dynamics offers a pad adapter / clamp ring to accept Stealth Products Swing-Away hardware which can be added to the Single or Multi-Axis Dynamic Head Support Hardware. Lateral pads or switches (not included) can be added to the Swing-Away Hardware and are available from those manufacturers. A sub-occipital pad provides support at the posterior base of the skull at the sub-occipital shelf. This level of support is often used to provide some actual weightbearing of the skull for postural support, to limit neck hyperextension and to promote a midline position. If a client is using a head support system that includes both an occipital and a sub-occipital pad, our hardware can accommodate this. Seating Dynamics offers an adapter to accept the Stealth Products sub-occipital pad. Seating Dynamics offers quick-release removable hardware so that the head support can be easily removed, as needed. The head support may need to be removed for transfers (i.e. if this interferes with a sling) or if the wheelchair is being folded for transportation (with the client transferring to another seat within the vehicle). A concussion can occur when the head collides with force against a surface. According to the Dr. Kim Gorgens of the University of Denver (Science Daily; June, 2010), a concussion can occur at 95 g’s. G-Force is a unit of force equal to the force exerted by gravity. The average football player receives 103 g’s when hit during a game. Some clients using wheelchairs bang against the head pad with significant force, perhaps even enough force to cause brain injury. Degree of force and repetitive impacts only increase risk of injury. Dynamic components absorb force, reducing this risk. Clients who extend against a head support with sustained force are at risk of neck injury (including strains) due to forces occurring through the soft tissue and vertebrae of the neck. The Dynamic Head Support Hardware absorbs forces exerted by the client which may have led to equipment breakage in the past and can prevent future breakage. The dynamic component absorbs these forces, whether from extensor tone or banging, protecting the head support and hardware from damage. Breakage may result in the client being unable to use their wheelchair until repairs are made or the head support is replaced. In combination with a Dynamic Rocker Back and Dynamic Footrests, Dynamic Head Support Hardware can diffuse forces and provide movement for decreased agitation and increased sitting tolerance, function, energy conservation, and alertness. The Single Axis Dynamic Head Support Hardware works well for clients who exert force against the head pad primarily in a posterior direction. This hardware will respond to force nearly anywhere on the head pad itself (rather than only if the center of the head pad is contacted). The Multi-Axis Dynamic Head Support Hardware works best for clients who exert force against the head pad in multiple directions. Many clients rotate during neck extension, often influenced by an Asymmetrical Tonic Neck Reflex (ATNR) or muscle tone. This hardware will respond to force in any direction and up to 8 degrees (the amount of travel will vary with the combination and orientation of the links, due to leverage. The range that the pad travels is 1” to 2” depending on the combination and position of links.